OpenCart, a user-friendly and feature-rich open-source shopping cart solution, offers a simple yet appealing interface for all businesses to attract more clients and boost their sales. 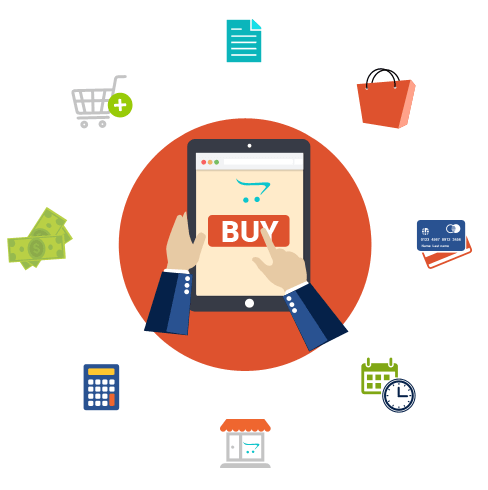 The OpenCart developers at WeblinkIndia, a leading OpenCart development company, develop visually appealing e-commerce websites that are integrated with numerous features. With years of experience in offering OpenCart development services, we develop websites that are responsive, have multiple shipping & payment methods, and are quick to load despite showcasing thousands of products and services. 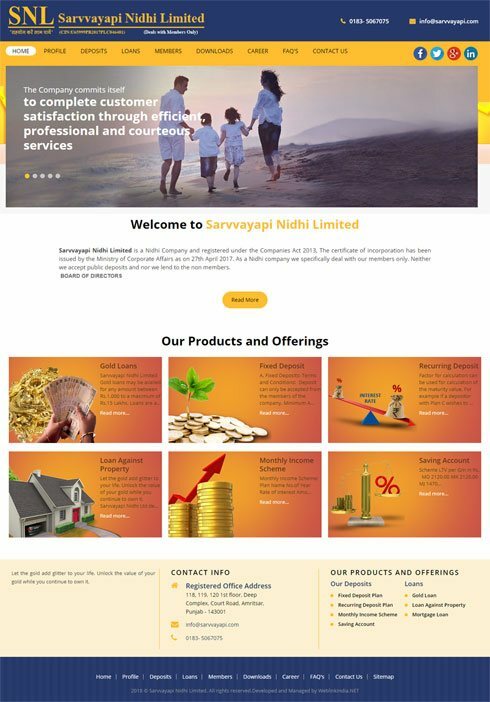 Sarvvayapi Nidhi Limited is a Punjab-based organization registered under the Companies Act 2013 and certified by the Ministry of Corporate Affairs in 2017. We are engaged in offering different loan plans to the clients. Our products include gold loan plans, terms deposit, our interest rate, mortgage loan, monthly income scheme, and LTV for gold loan. We help you in getting these loans sanctioned without any hassles. To know more about us, visit our website that is designed, developed, and managed by WeblinkIndia.Net Pvt. Ltd.
Kiyo Office Equipment FZE, is an established and leading co, situated in RAS AL KHAIMAH FREEZONE (TECHNOLOGY PARK) IN U.A.E., which deals a wide range of Consumables and Spare Parts of Photocopiers and Printers. ThinkSMART is a manufacturer and trader of smart and digital products. our company base is located in Dubai, United Arab Emirates and our products is inclusive of Interactive Classroom/Meeting Hub, Interactive Tables, LED Technology, Video Wall, Transparent LCD, Digital Signage, Switch Glass, 3D Hologram, Interactive/Smart Mirror and Interactive Glass. Besides, we provide smart solutions for marketing, branding and advertising. Backed by a team of skilled individuals, we provide solutions that comply with the stated industry codes. The website for our company is designed by WeblinkIndia.Net Pvt. 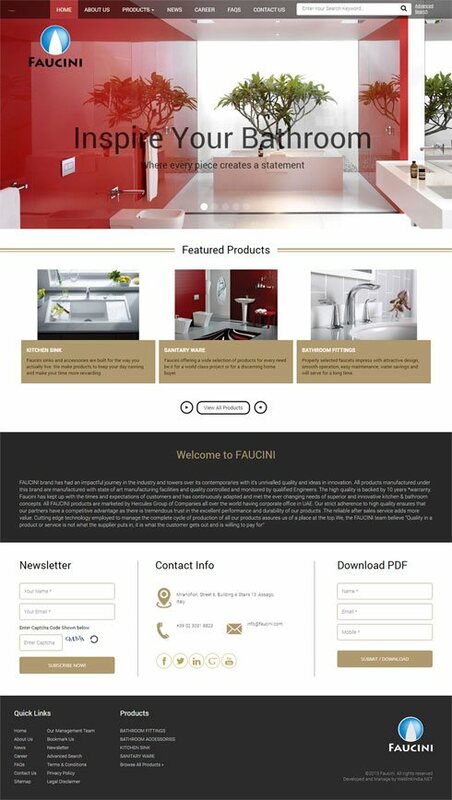 Ltd.
A well-defined range of Bathroom Fittings, Bathroom Accessories, Kitchen Sink, Sanitary Ware and other products is available at FAUCINI. A renowned brand, we have established a dignified position in the market owing to our impressive and affordable range of products. Using the latest manufacturing facilities, we have developed such a fine range of Fittings and Accessories compatible to kitchen & bathroom concepts. We have our corporate office in UAE and our products are marketed by Hercules Group of Companies all over the world. The website for the company is designed and developed by WeblinkIndia.Net Pvt. Ltd.
Based on PHP and MySQL, open cart offers impeccable cross-platform compatibility. Open Source Platform And Free Shopping Cart, With Zero Installation Fee. East To Manage, Neat And Immaculate Administration Panel. Lightweight E-Commerce Solution That Works On AJAX Technology To Reduce Load Times And Increase Site Speed. Helps You To Bag Global Exposure Through Multi-Currency And Multilingual Support.